FOLLOW THE LINK BELOW ! Sandworm is an organic structure/space/creature realized on the dunes of the Wenduine coastline, Belgium. 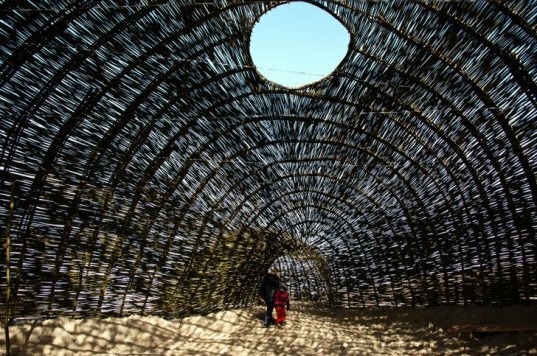 The 45 meters long and 10 m wide and high installation moves freely in-between architecture and environmental art and is constructed entirely out of willow following the local knowledge of working with sand and willow. Casagrande worked hard with his team of young architects and local experts for 4 weeks in order to create something that he describes as 「weak architecture」 – a human made structure that wishes to become part of nature through flexibility and organic presence. The visitors are describing the Sandworm as a willow cathedral finely tuned to celebrate the site specific conditions of the Wenduine tidal beaches.